Booking your stay at I Pretti R.T.A. by April 30 you will be entitled to a 10% discount . Favignana is one of three of the Egadi Islands in Sicily, with Levanzo and Marettimo and the islets Maraone and Formica. At 15,000 miles west of the coast of Sicily, the archipelago of the Egadi Islands with Its 1,523 square kilometers, since 1999 is the largest reserve of Italy Marina and the sea, to the hydrodynamic conditions of the seabed, is among the clearest and cleanest in the Mediterranean. Built in 1873, the Genoese industrialist Eugenio Pretto, for storage and processing of sardines, the craft factory called "I Pretti" distorted by the name of its manufacturer, was sold in 1874 to more inspired Entrepreneur of the Florio family, Ignatius Senior. The charm of I Pretti R.T.A. , finds its highest expression in the attention to detail, elegance and strong personality of its 16 Suites, 13 of which with direct access from the garden courtyard. In the heart of the R.T.A. , a few meters from the intense life of the marina and the center of Favignana, opens an enchanting Mediterranean garden of over 2000 square meters, lush and quiet, where you can have breakfast, you will have the opportunity to have a drink and relax under the blue sky or under the stars. Take a few steps to look out in a particularly attractive setting reminiscent of the atmosphere of an old cruise ship. It is the terrace of I Pretti R.T.A. , softened by the original nineteenth tile carpets, overlooking the deep blue sea that looks Levanzo. A privileged position to dominate from the entire Gulf of Favignana, with the view of the old Building, designed by Damiani Almeyda for the Florio family, the Port, the charming ancient Florio and Castle on St. Catherine mountain. All this, without sacrificing privacy, tranquility and glamor of an unforgettable holiday. The Favignana island is built around the two squares: Piazza Europa and Piazza Madrice, connected to the main street of the evening stroll destination, where you can see the classic craft shops, the typical local restaurants that serve fresh seafood, the local evening for an aperitif or an after dinner drink. But what will remain absolutely imprinted in my mind and heart, After your stay in Favignana, will definitely be the color of the sea ... the most intense shades to fill your mind while vacationing on the island! But even more spectacular and fascinating are the rocky coves, in particular we remember the famous Cala Rossa, with a terrace overlooking the sea as soon as we discern that fills us with emotion .... and the nearby Cala del Bue Marino. Different in appearance and colors, but both areas are derived from the extraction of the tuff. other side of the island instead we find beautiful coves and beaches such as Cala Rotonda, Cala Grande and Punta Ferro, the starting point for lovers of diving and snorkling. I Pretti R.T.A. 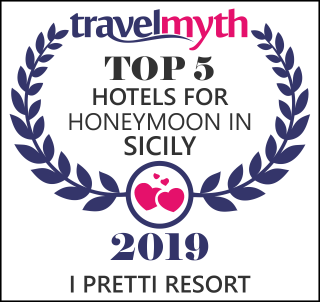 , in the heart of the beautiful island of Favignana, including packages, promotions and special offers for the summer 2019 in Sicily, the Egadi islands, able to surprise you for an amazing holiday for two, with friends or with family and children. Hotel I Pretti R.T.A. also your children up to 3 are free. Contact us for a wonderful holiday in Favignana, at I Pretti R.T.A. , including superior, deluxe and exclusive, for a vacation the most beautiful island of the Egadi! Even just for a romantic weekend in Sicily in Favignana, wellbeing and relaxation thanks to our beautician will offer you all summer in 2019, relaxing massages, treatments, beauty holidays in Sicily. Click in the section dedicated to special offers and packages, summer promotions from June, July, August and September 2019 for an amazing holiday! white beaches and rocky coves dug in the limestone quarries of the island of Favignana, the exciting colors of the sea, a trip on a sailing boat between the Egadi islands Marettimo and Levanzo, catamaran trip, you can rent a bike or motorcycle , and you will be really charmed by this holiday in Sicily! Many are the opportunities for a holiday in Sicily with last minute and all inclusive all inclusive. Click here for a complete guide on your holidays by the sea to the island of Favignana in the summer season from May to October 2019, catamaran trips, outings with the island's fishermen for fishing tourism, tips for your trip in Sicily and for a romantic weekend stay in pairs!